As said elsewhere, the cadets used to go to "Raven's Ait" at Surbiton on the Thames each year. This is the 1967 group. Some of those in full uniform are training team from the island, so not from Newhaven, and the two standing at each end, were I believe, Dutch cadets. This page was added by John Sweatman on 15/06/2012. This picture brings back fond memories I'm sure to many former cadets, I myself remember being paired up with the late leading seaman Leonard Lipscombe, as 'Raven's Ait 'as liberty boat crew ( For bringing over visitors and departing cadets etc! ) We maintained these duties for our period of the set 'watches' scheduled over our week at the island, as the whole island was run on a ships routine of watch keeping. What great memories I have of Ravens Ait when I was part of the ships company ( T.S. NEPTUNE) though I was a leading seaman with T.S.Thunderer, East london and spent as many w/e as I could down on the Ait and several weeks as working holidays .This was around 1964 to 1967 but my career took me to Germany and the USA then back to the UK. I would love to hear from anyone who remembers those great days. Just to add to these memories, I remember while at 'Ravens Ait' as each member of our five lad crew was taking a pulling certificate out on the river, we were rammed by a pleasure cruiser which was on its way to Hampton Court, this inccident caused major damage to the A.S.C. dinghy not to mention we were all a bit stunned by the accident thankfully no one was hurt, it was not until the pleasure cruisers returned down river that he was called to account as he had not stopped after the collision. Are there any cadets who were at Ravins Ait closing down ceremony and also at the reopening ceremony when HRH Duke of Edinburugh came, I was fortunate enough to be at both and was part of the guard of honour. I remember Raven's Ait well. I went there on successive years from 1966. I can't see myself in the photo but I'm pretty sure that Front Row seated, 1st left is David Cameron. Same school year as me. I remember going to Ravens Ait a couple of times around 1959/60, both my brothers went there also. For many boys there it was a chance of a holiday with lots chucked in, where else could we get boating canoeing, etc 7 days a week, yes we had to dodge river traffic, but the tidal drop was inches, current near zero. Back home a tidal drop of 25 feet with a ferocious current under the bridge! Yet we took it in our stride, without health and safety to wreck our fun, boys grew up learning how to handle risk and have pleasure. Great days. Learned how to steer a motorboat there, and serve in a wardroom. Neither of which has been of the slightest use, so much the better. Stuart Forbes...Facebook! I remember going there as a cadet back in the mid 60's. Fantastic and learned to sail there. I was from TS Terra Nova, "The Waldrons" Croydon. The kids today are missing out on so much. Hello Don Waller. I remember being at the ceremony when the Duke of Edingburgh inspected the ships company and spoke very briefly to all the assembled cadets. I was assigned to one of the boat crews on that visit. We visited the island several times and we would march from the railway station, to the ferry port, before getting on the boat over to the island. 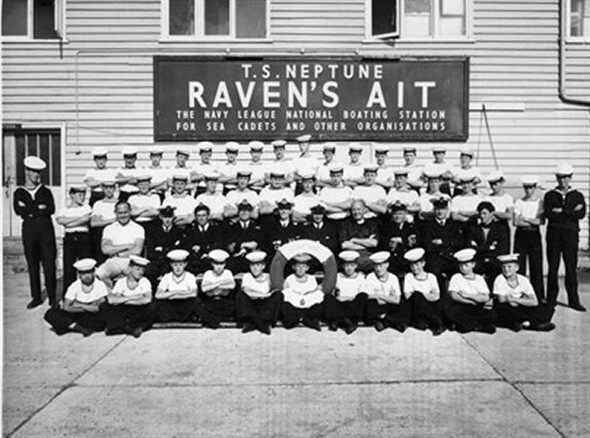 I was on TS NEPTUNE in 1959 and 1963 with the PRESTON UNIT of the G.N.T.C later to be joined with the SEA CADETS. It was a fantastic time I wonder if there is anyone who remembers those happy times. As a member of TS Sikh Beckenham & Penge unit. I had many wonderful weekends there. I was a member of the boats crew that pulled Prince Phillip up the river to the sailing club. Would love to hear from cadets at that time. I have happy memories of Ravens Ait probably around 1956/7. I was the only one from the Preston, Lancs GNTC, joined with a group from Morecambe. Had loads of laughs and loved the rowing and canoeing. One year we had a visit from our Commandant Mounbatten and sat next but one to her in a photo call. I lived on the Island in 1962/63. My father was a chef for the Sea Cadets. I learnt to fish, sail and canoe on the Island and attended St. Andrews School in Surbiton. I have many fond memories of those years and I would love to get in contact with anyone who still remembers me.